Abstract—The aquaculture sector started in Malaysia since 1920s and has developed quickly nationwide. Sustainability of aquaculture depends on its adaptability to environmental changes. This research includes the study on the impact of the National Policy on Climate Change on the aquaculture industry. Policy appraisal and impact assessment approach have been carried out by having experts’ interview and survey questionnaires. The Policy is expected to promote aquaculture sector according to its principles, strategic trusts and key actions. In line with this, the respondents suggested several criteria for the aquaculture sector to be climate resilient and hence developed in a sustainable manner. The results from analysing the Policy and the suggestions from respondents are expected to aid developing a climate-resilient aquaculture system model. Hence, better understanding of the potential climate change policy impact on aquaculture enables the policy-makers and stakeholders to plan and implement possible countering measures to achieve sustainability in aquaculture. Index Terms—Aquaculture, climate change policy, climate resilient aquaculture, policy impact. 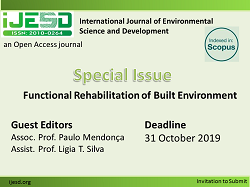 The authors are with the Environmental Science Programme, Faculty of Science and Natural Resources, Universiti Malaysia Sabah, Jalan UMS, 88400, Kota Kinabalu, Sabah, Malaysia (e-mail: vincent_91cs@outlook.com, melpayus@ums.edu.my, bvun@ums.edu.my, sky_blue9115@hotmail.my). Cite: Chee Sheng Woon, Carolyn Payus, Leong Wan Vun, and Wei Peng Lee, "Perceptions of Relevant Stakeholders towards the Impact of Climate Change Policy on Aquaculture Activities in Malaysia: Some Preliminary Findings," International Journal of Environmental Science and Development vol. 8, no. 7, pp. 534-538, 2017.